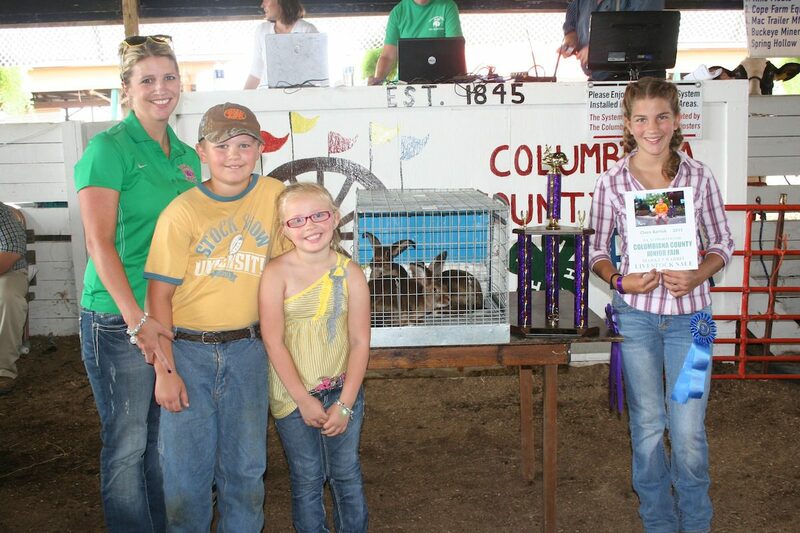 Claire Barrick's grand champion market rabbit pen sold for $450 to Buckeye Boiler, represented by Melanie Wanchick, and Ellie and Kesston Wanchick. 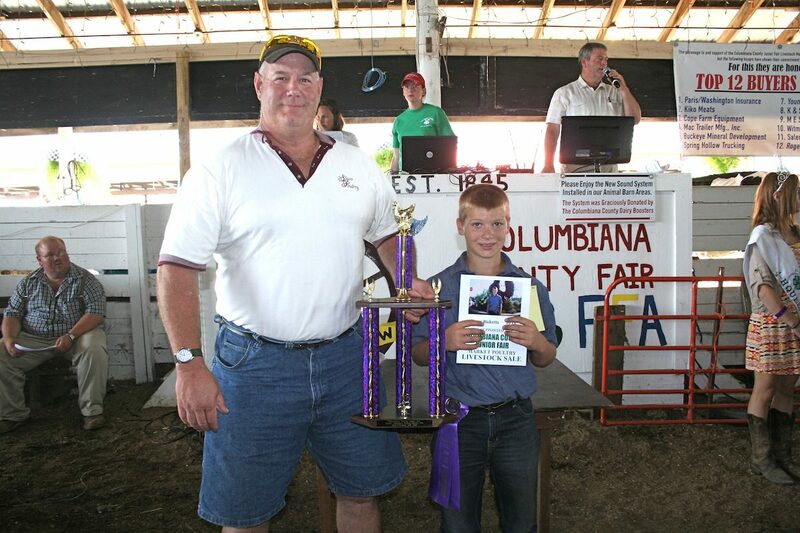 Cole Birkhimer’s grand champion carcass hog, weighing 251 pounds, sold for $7 a pound to Paris Washington Insurance, represented by Kelly Palmer. 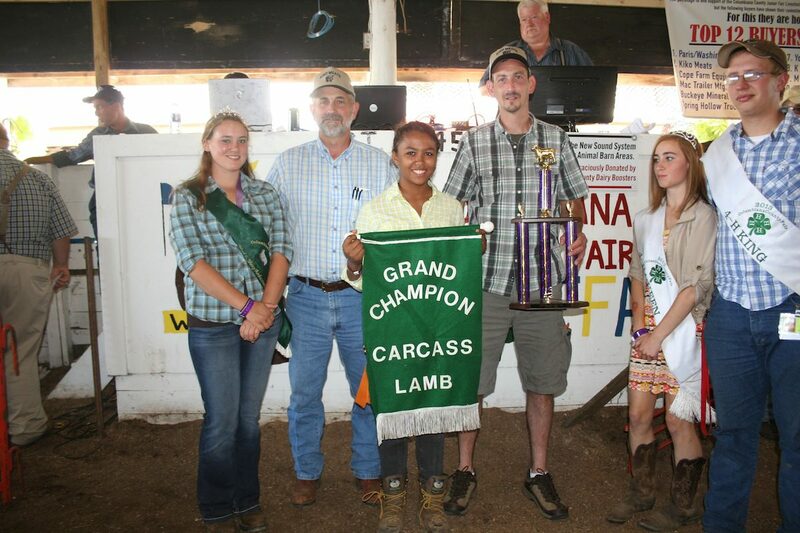 Hailey Tucker’s 110-pound grand champion carcass lamb sold for $5.25 a pound to Kiko Meats, represented by Ron and Steve Kiko. 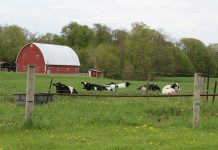 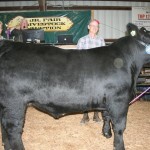 Case Farms, represented by Chuck Sluss, paid $600 for the grand champion pen of market poultry raised by Isaac Ricketts. 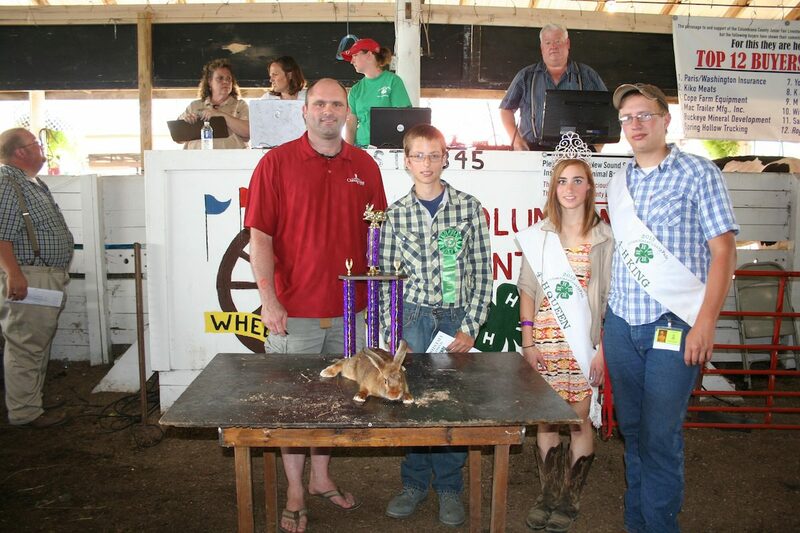 The grand champion single fryer rabbit, raised by Sam Barrick, sold for $225 to Chesapeake Energy, represented by Jesse Redwine. 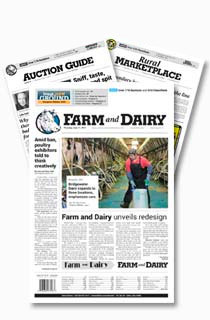 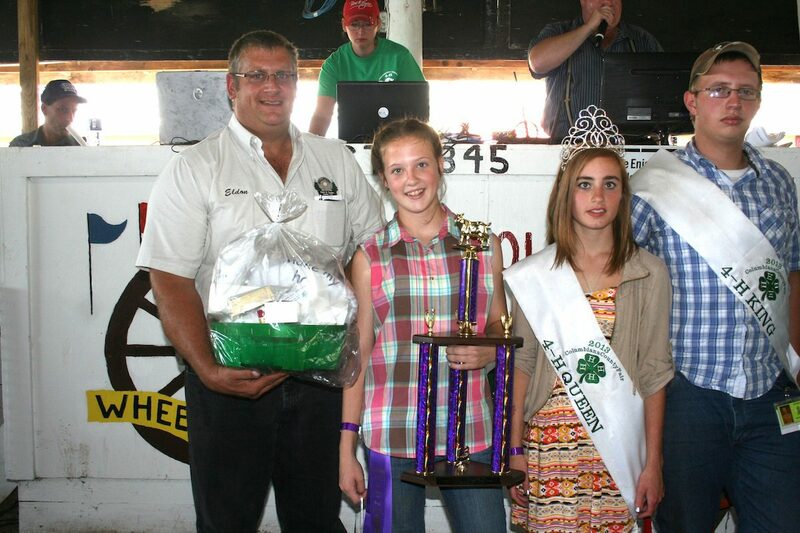 Bethany Crouch’s grand champion dairy goat fudge basket sold for $375 to Millstone Farm and Garden Center, represented by Eldon Falb. 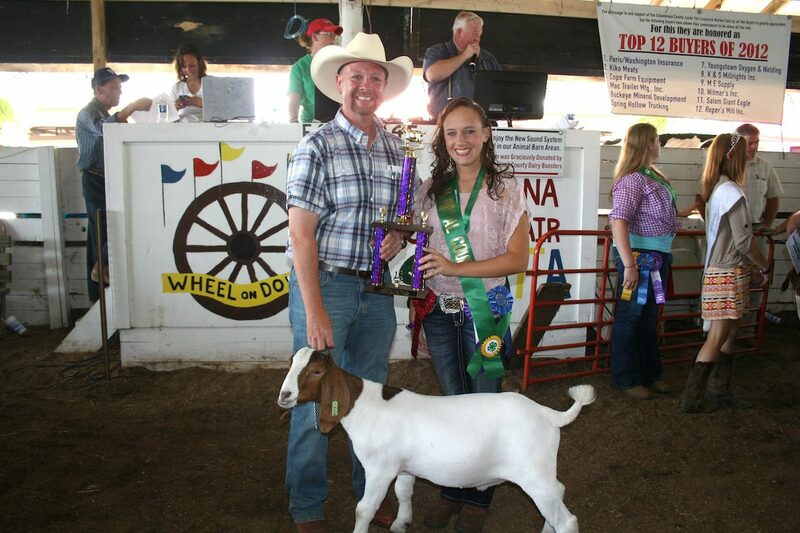 Alissa Baer, who also won grand champion goat project honors, sold her 79-pound grand champion market goat for $3.75 a pound to Lisbon Sav-A Lot Food Store, represented by Rick Stacy. 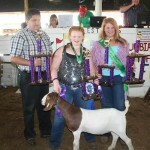 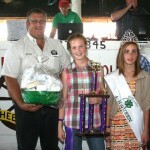 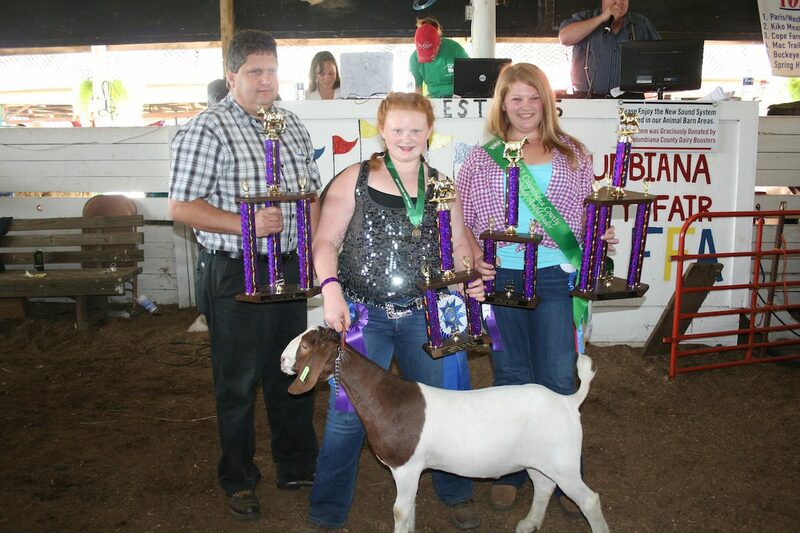 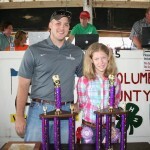 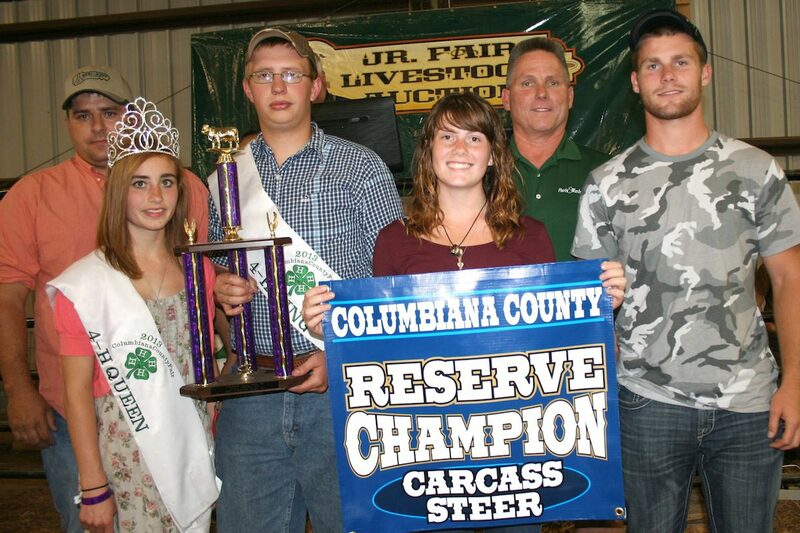 Also pictured is Holly Baer, Columbiana County meat goat ambassador. 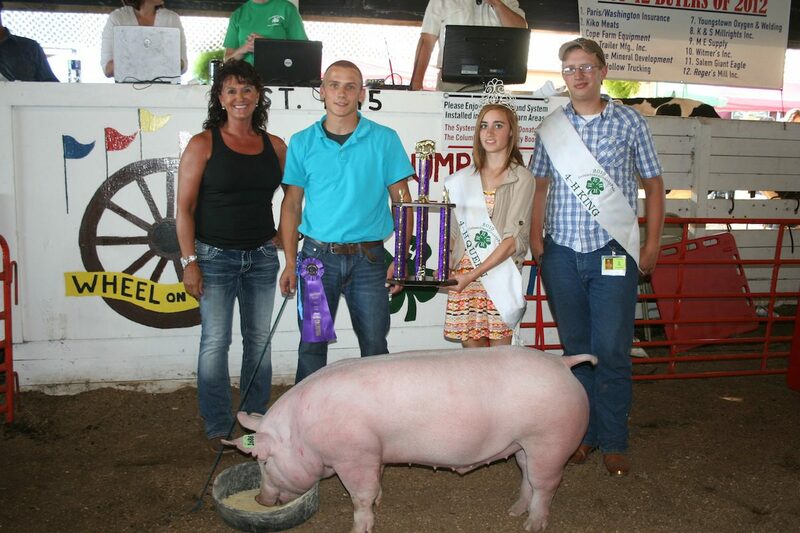 Mikey Estock’s 271-pound grand champion market hog sold for $22 a pound to MAC Trailer, represented by Jenny Conny. 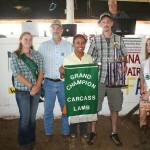 Margaret McNicol’s 154-pound grand champion market lamb sold for $5 a pound to Rick Stacy of Lisbon Sav-A-Lot Food Store. 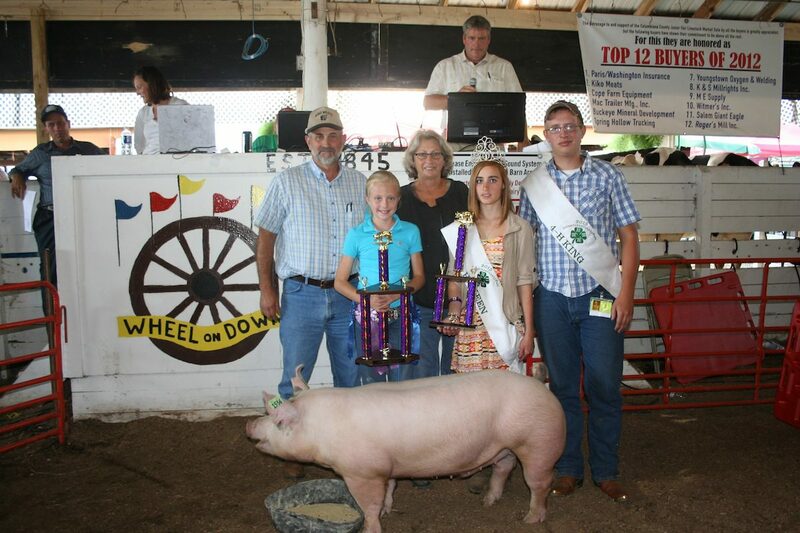 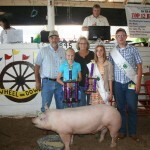 Mackenzie Kiko won the outstanding youth project in the hog division, and was showman of showmen. 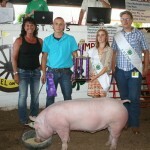 Her 290-pound hog sold for $7 a pound to Paris Washington Insurance, represented by Kelly Palmer. 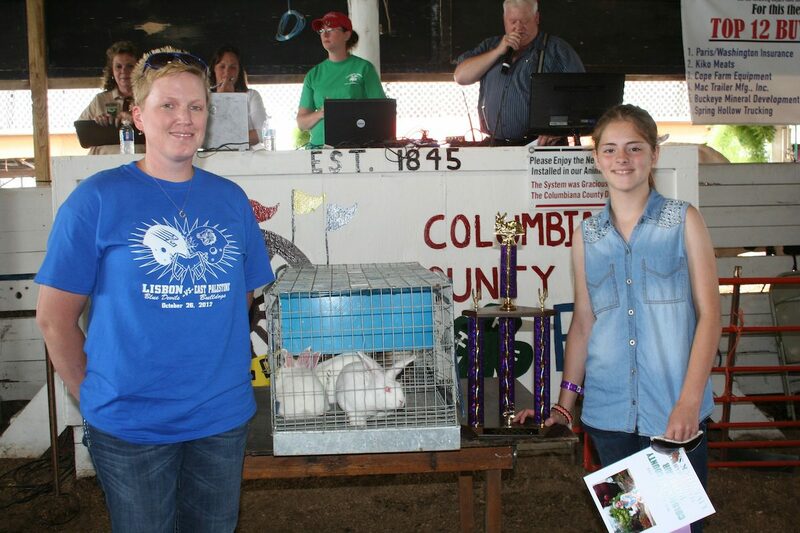 Claire Barrick’s grand champion market rabbit pen sold for $450 to Buckeye Boiler, represented by Melanie Wanchick, and Ellie and Kesston Wanchick. 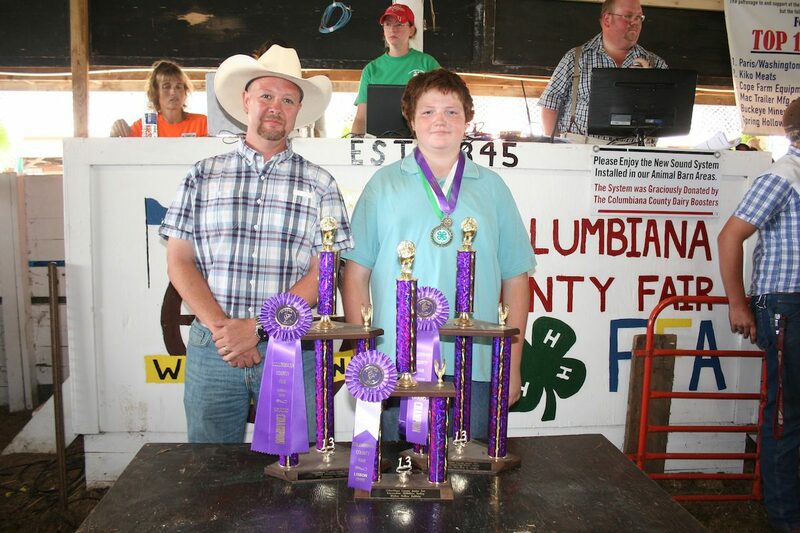 Michael French, who also won grand champion turkey project honors, sold his grand champion turkey for $425 to Crabb Insurance, represented by David Mollenkopf. 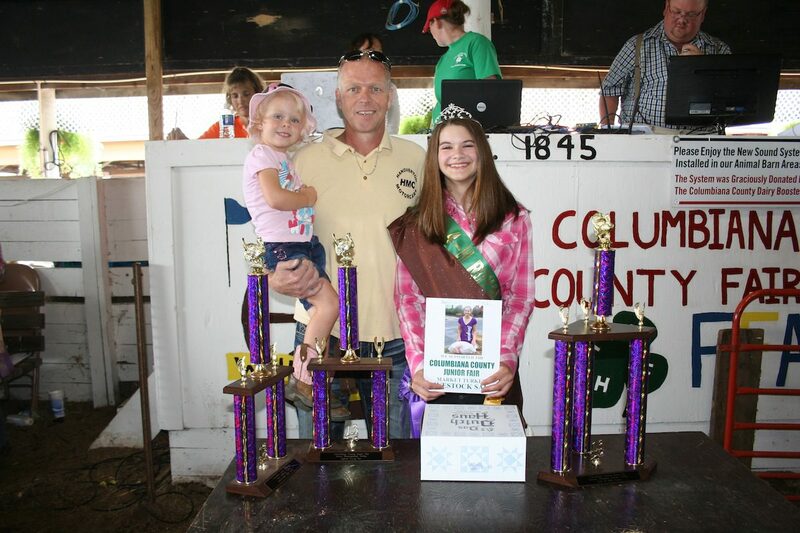 Hannah Foster’s grand champion carcass turkey, weighing 43.2 pounds, sold for $700 to Hanoverton Motor Cars, represented by Don Hofmeister, and Addyson Hofmeister. 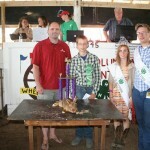 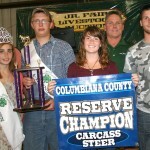 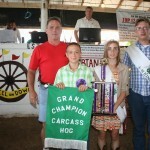 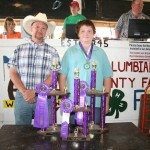 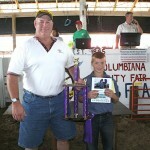 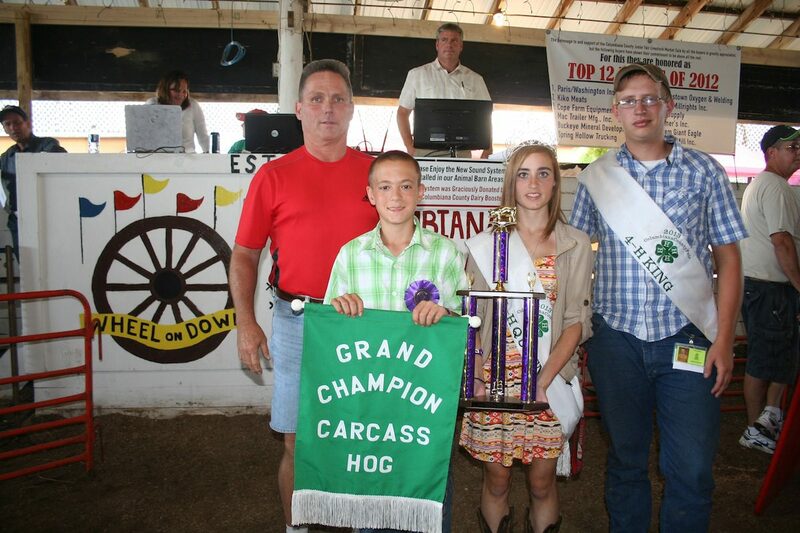 Harrison Hoppel raised this year’s reserve champion carcass hog weighing 268 pounds. 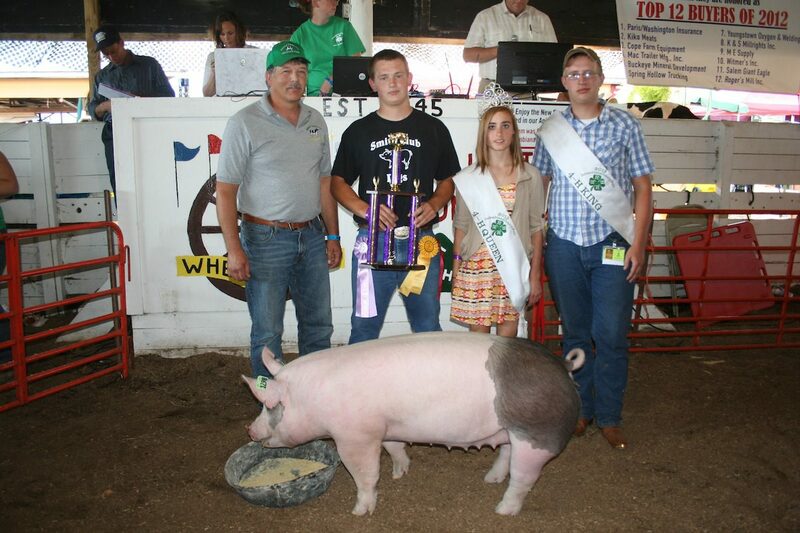 West Point Paving, represented by Mike Hoppel, paid $4.25 a pound for the pig. 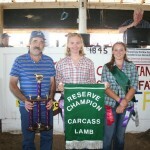 Rebecca Bock’s reserve champion carcass lamb, weighing 128 pounds, sold for $3.50 a pound to Joe Ramsey of Ramsey Hoof Trimming. 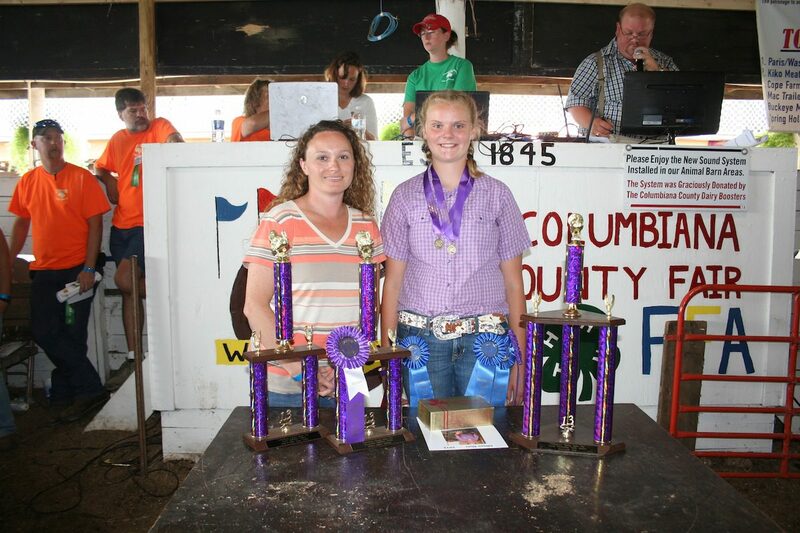 Spring Hollow Trucking, represented by Launi Rosenberger, paid $810 for Alexia Didick’s reserve champion pen of market poultry. 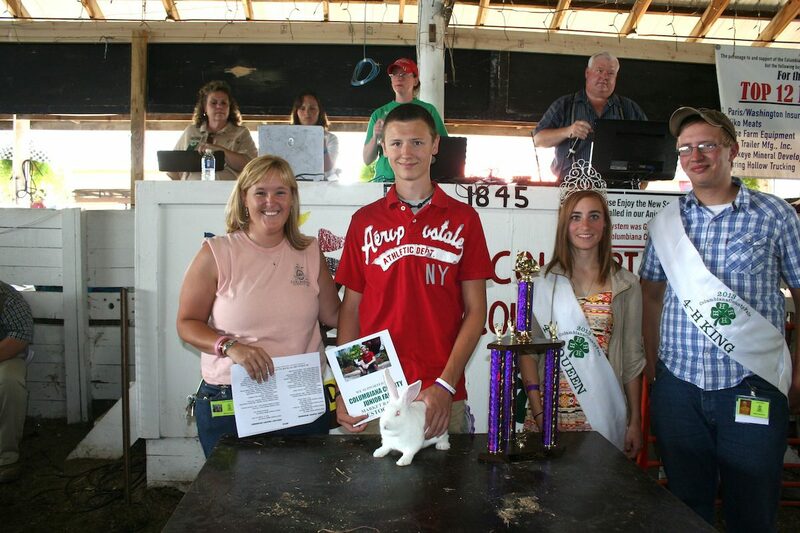 Cody Wright’s reserve champion fryer rabbit sold for $100 to A Feel For Life Massotherapy, represented by Amanda Moore-McKenzie. 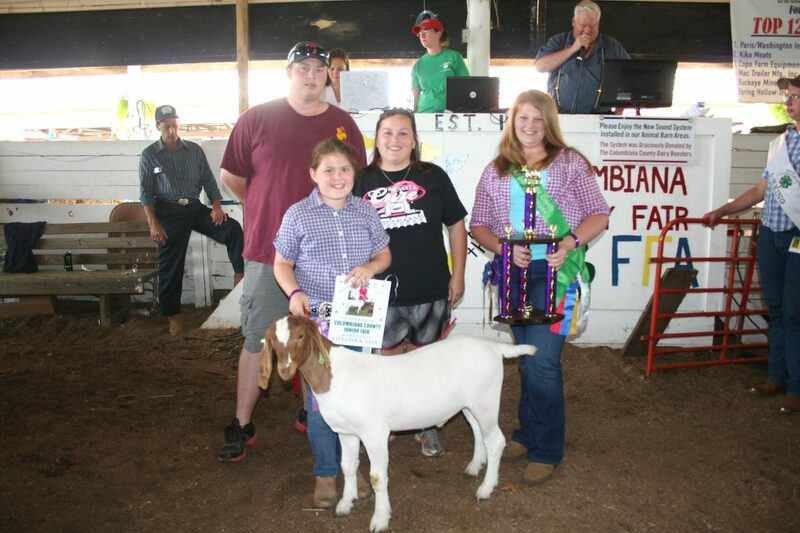 Aubrey Shaffer’s reserve champion dairy goat fudge basket sold for $300 to Wishau Hollow Rabbitry, represented by Katie Houk. 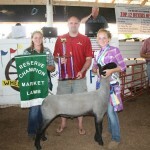 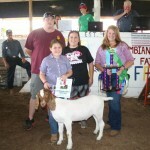 Lauren Hippely’s reserve champion goat weighing 87-pound sold for $8 a pound to Dwight Lang and Lisa Miller. 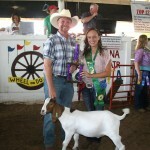 Courtney Hephner earned reserve champion goat project honors and sold her 88-pound goat to Crabb Insurance, represented by David Mollenkopf. 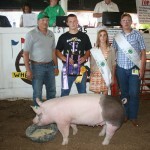 Jacob Smith’s reserve champion hog weighing 270 pounds sold for $3.75 a pound to Hanover Farms, represented by Neil Zehentbauer. 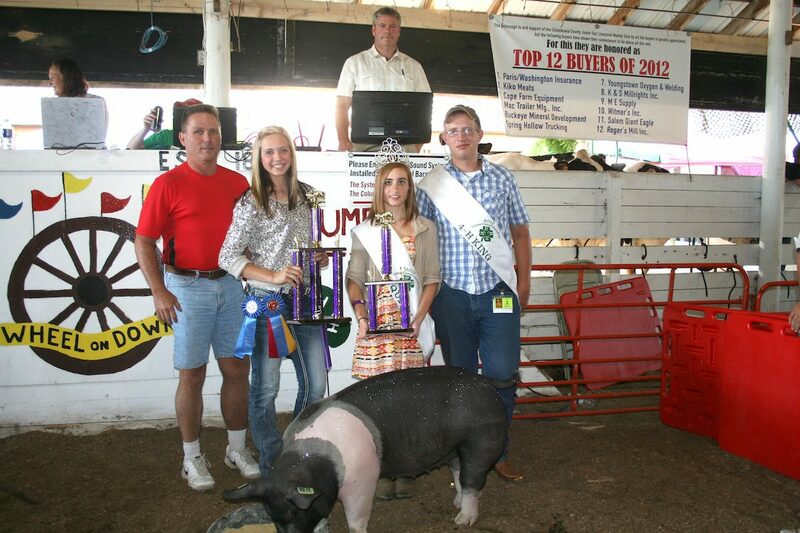 Also pictured are fair royalty Melinda Richey and Curtis Veiock. 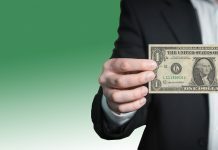 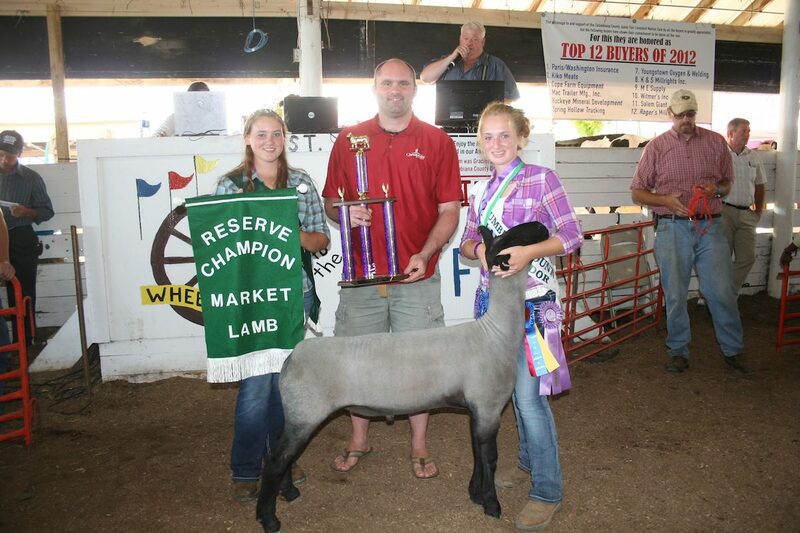 Hunter Urmson raised the 144-pound reserve champion market lamb, which sold for $4.50 a pound to Chesapeake Energy, represented by Jesse Redwine. 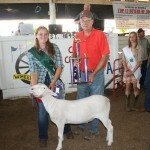 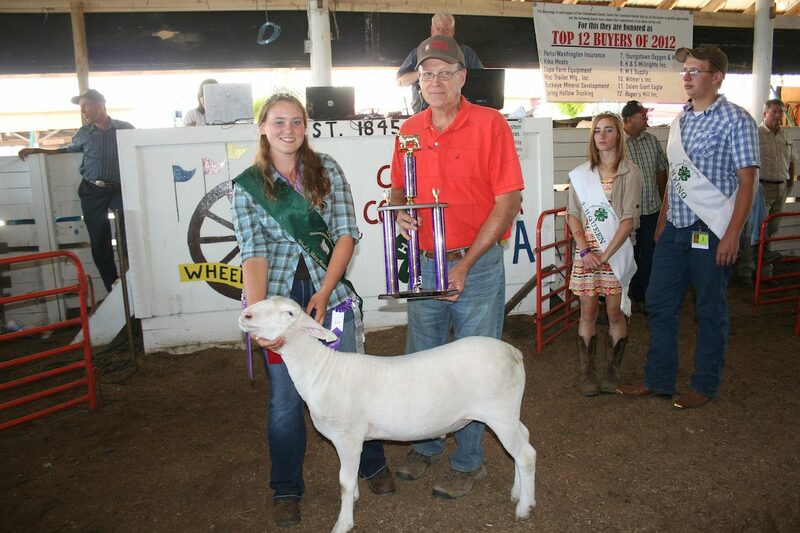 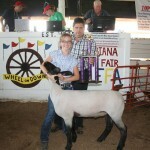 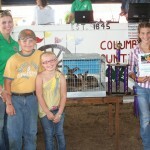 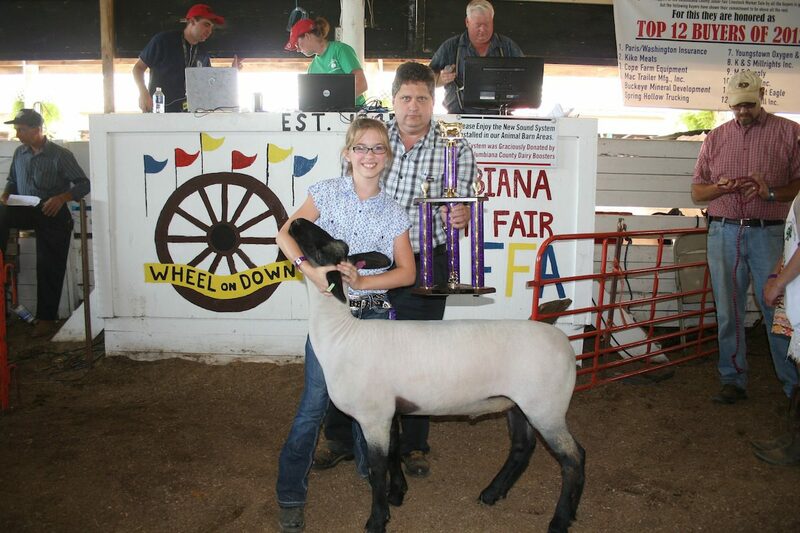 Also pictured is Hannah Swope, Columbiana County Sheep and Wool Ambassador. 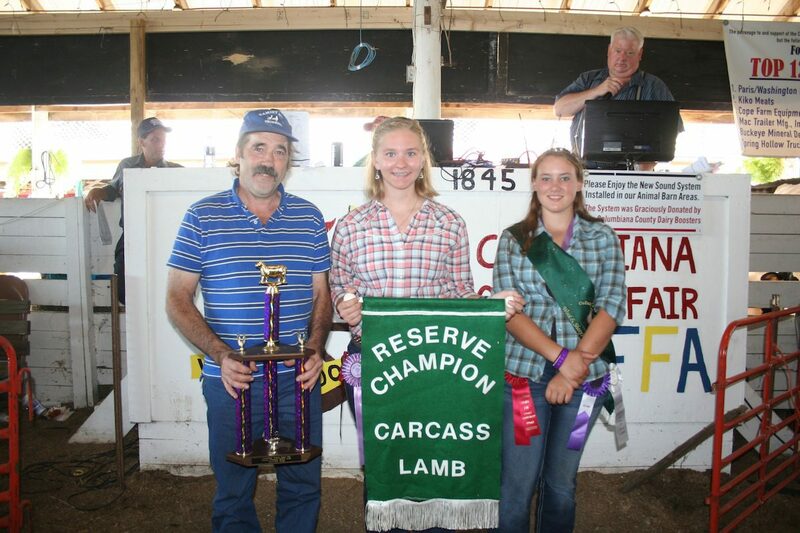 Hannah Swope’s reserve champion best project sold for $2.75 a pound to Carrollton Farmers Exchange, represented by Bruce Burgett. 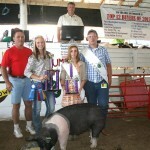 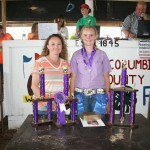 Haley Jones won reserve outstanding youth project in the hog division, as well as junior showmanship honors. 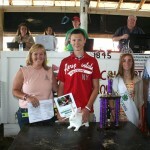 Kiko Meats, represented by Ron and Diane Kiko, paid $2.50 a pound for her hog. 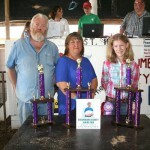 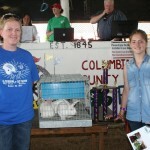 Ashley Wright raised the reserve champion pen of market rabbits, which sold for $300 to the Penn-Ohio Rabbit Breeders, represented by Mary Matthews. 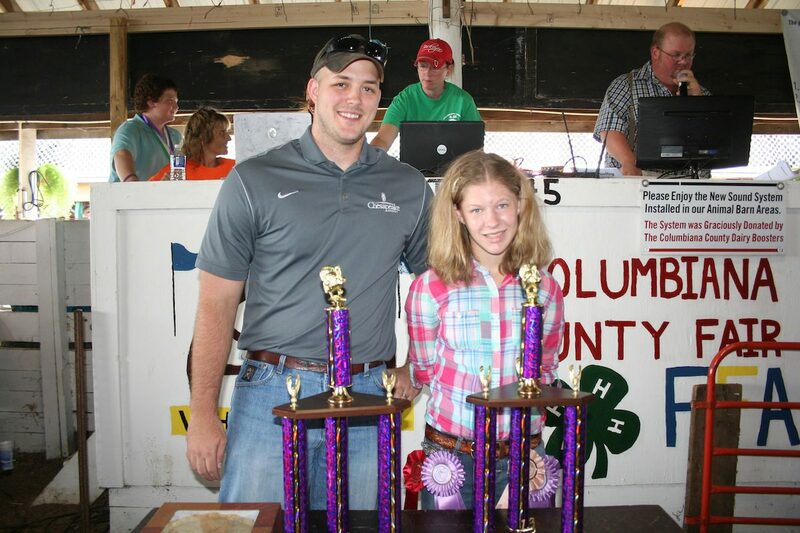 Emma Snyder’s reserve champion turkey sold for $400 to Chesapeake Energy, represented by Dustin Goldston. 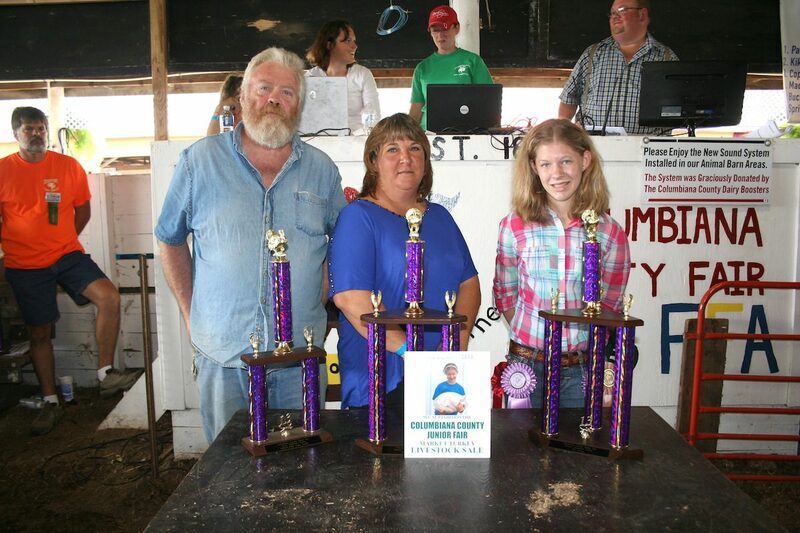 Emma Snyder’s reserve champion carcass turkey sold for $500 to Hanoverton Feed, represented by Keith Hebron and Cindy Black. 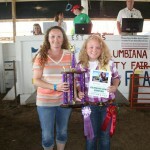 Allison Slutz won reserve champion project turkey honors. 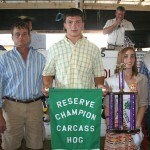 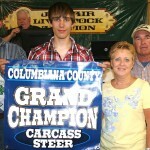 Dustin Campbell, of Homeworth, showed this year’s grand champion cheese yield cow. 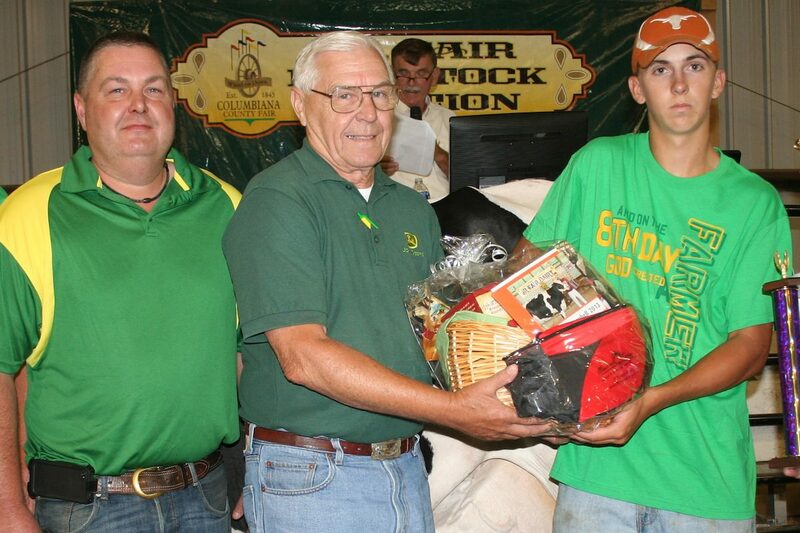 Cope Farm Equipment, represented by Robert and Alan Cope, paid $2,100 for the basket. 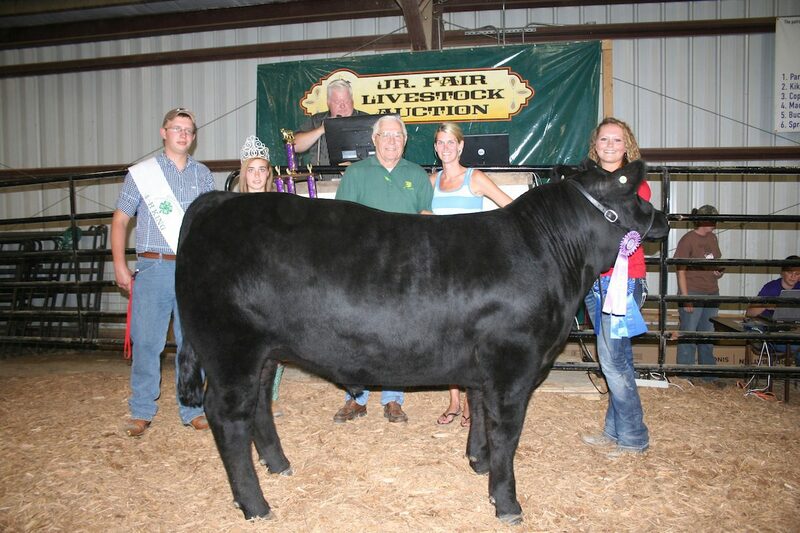 This year’s grand champion dairy beef feeder, raised by Madison Malloy, sold for $2.20 a pound to Kiko Auctioneers, represented by Pam and Ryan Kiko. 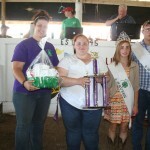 Also pictured are fair royalty Curtis Veiock and Melinda Richey. 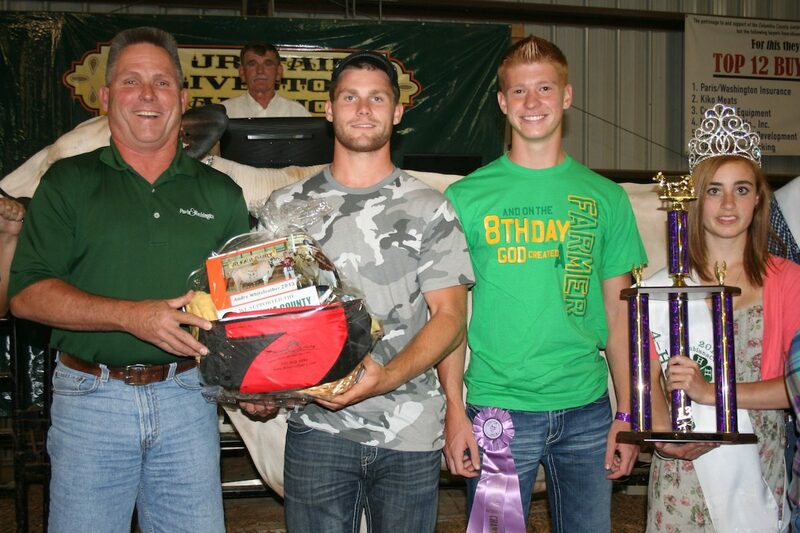 Andre Whiteleather’s reserve champion cheese yield basket sold for $1,400 to Paris Washington Insurance, represented by Kelly and Hunter Palmer. 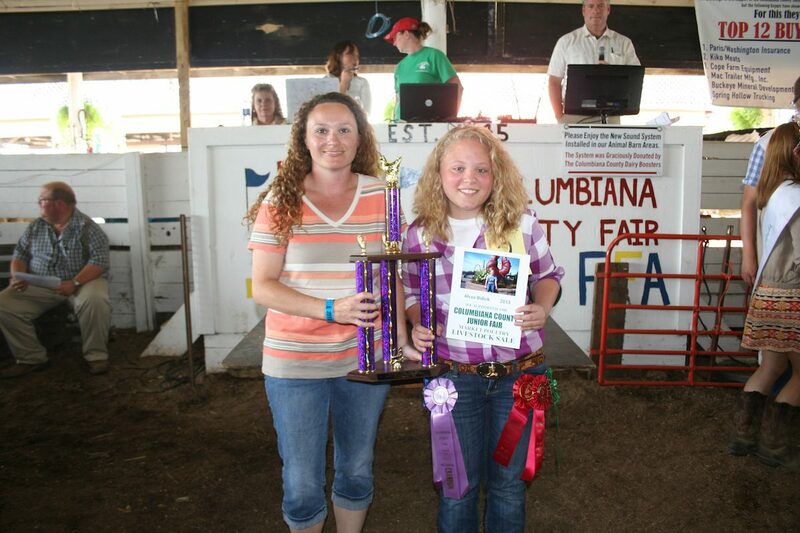 Chesapeake Energy, represented by Aimee Belden, bought Sydney Moats’ reserve champion dairy beef feeder weighing 592 pounds for $2.50 a pound. 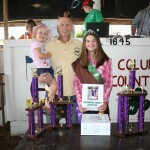 Also pictured are fair royalty Curtis Veiock and Melinda Richey, and trophy donor Wayne Herron. 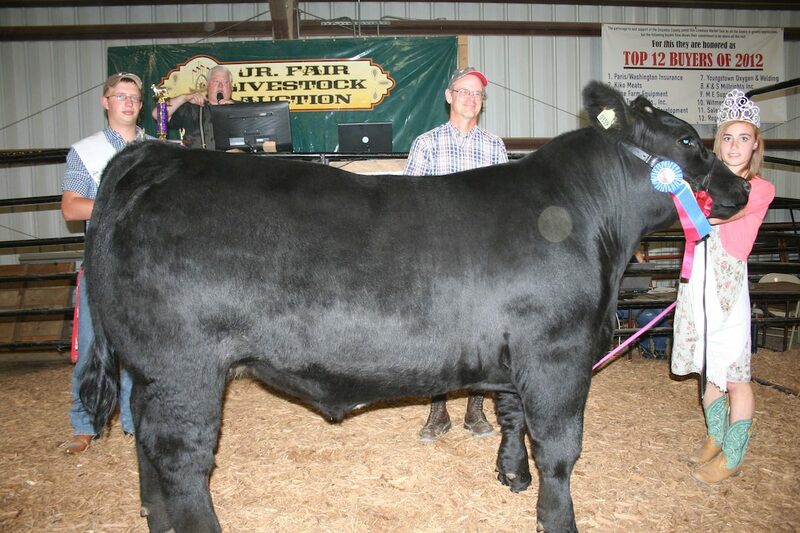 Melinda Richey’s 1,519-pound reserve champion project steer, which was also the rate-of-gain winner, sold for $3 a pound to the Lisbon Veterinary Clinic, represented by Fred Bennett. 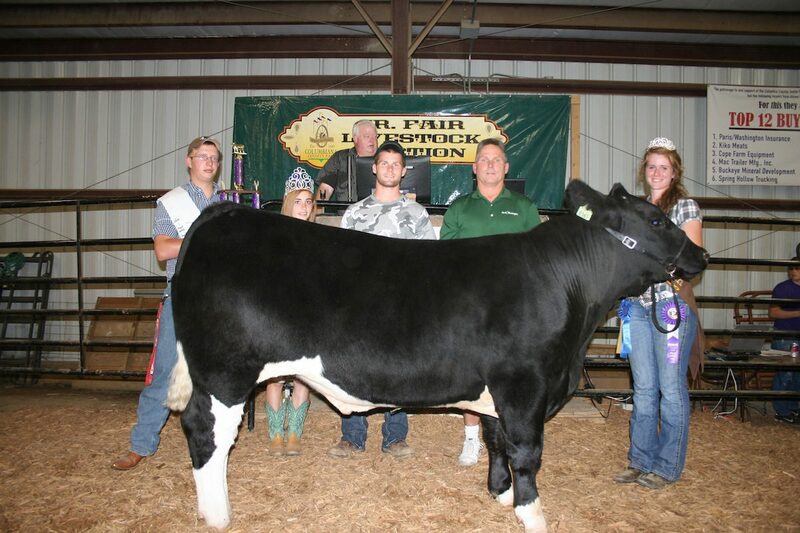 (Farm and Dairy photo) Rachel Ray’s reserve champion carcass steer sold for $2.50 a pound to Paris Washington Insurance, represented by Hunter Palmer and Kelly Palmer. 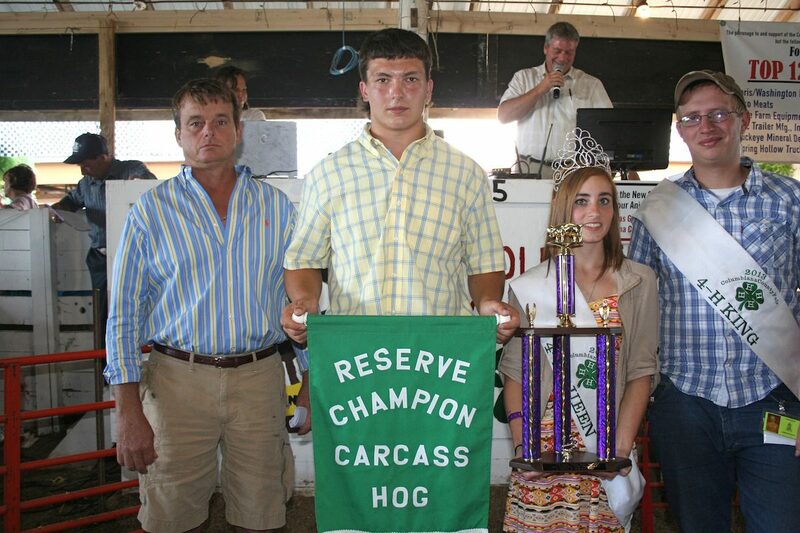 Alex Cope’s 1,311-pound reserve champion steer, which was also the Columbiana County born and raised champion, sold for $5.25 a pound to Cope Farm Equipment and Sarchione Ford, Sarchione Chevrolet and Sarchione Auto Sales, represented by Alan Cope and Alex Sarchione. 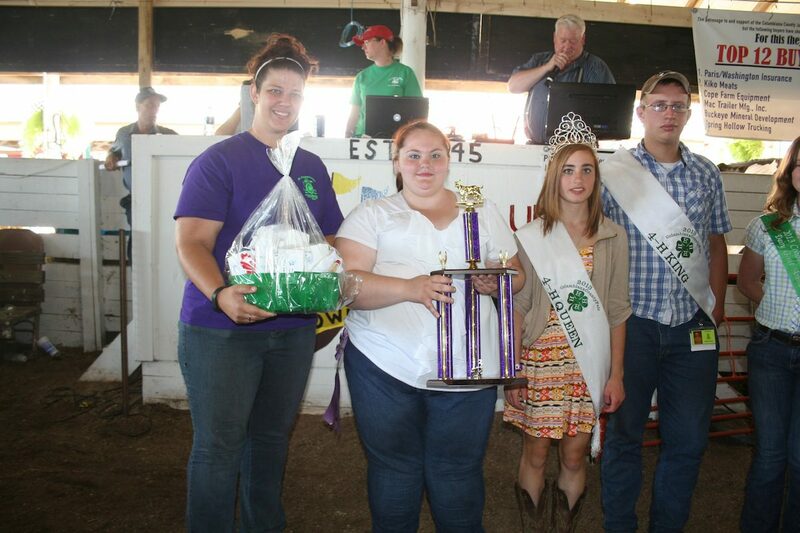 Also pictured are fair royalty Curtis Veiock and Melinda Richey. 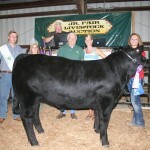 Haley Drake earned the grand champion steer project award. 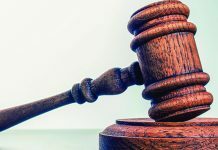 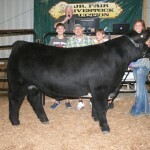 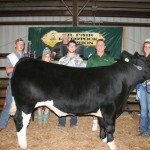 Her 1,326-pound steer sold for $3 a pound to Paris Washington Insurance, represented by Hunter Palmer and Kelly Palmer. 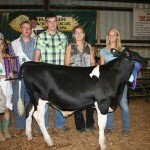 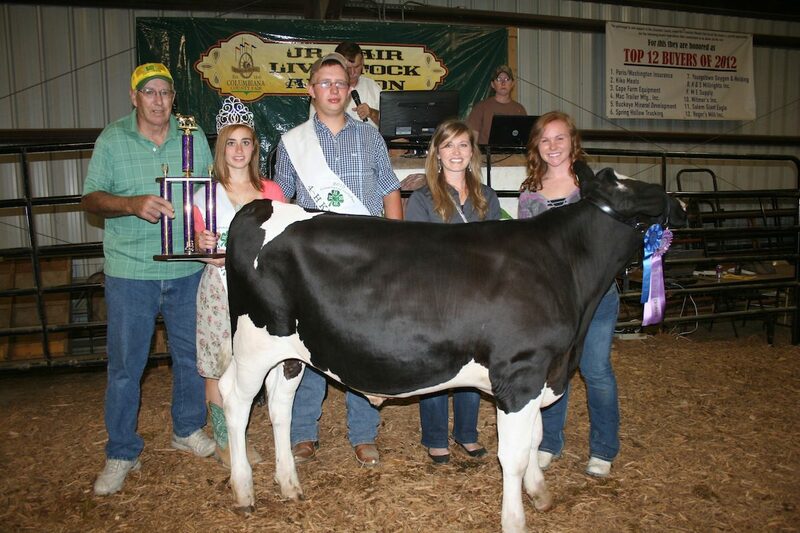 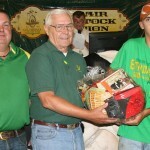 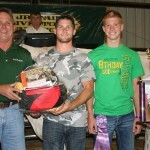 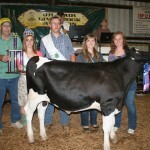 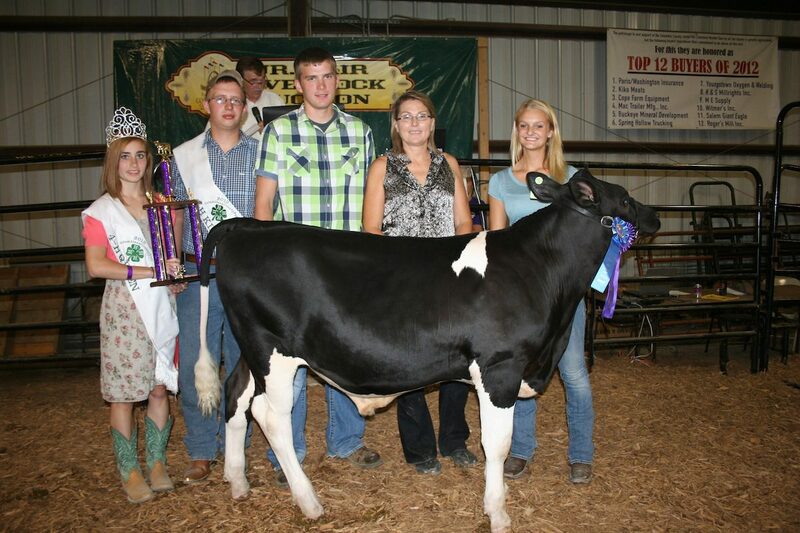 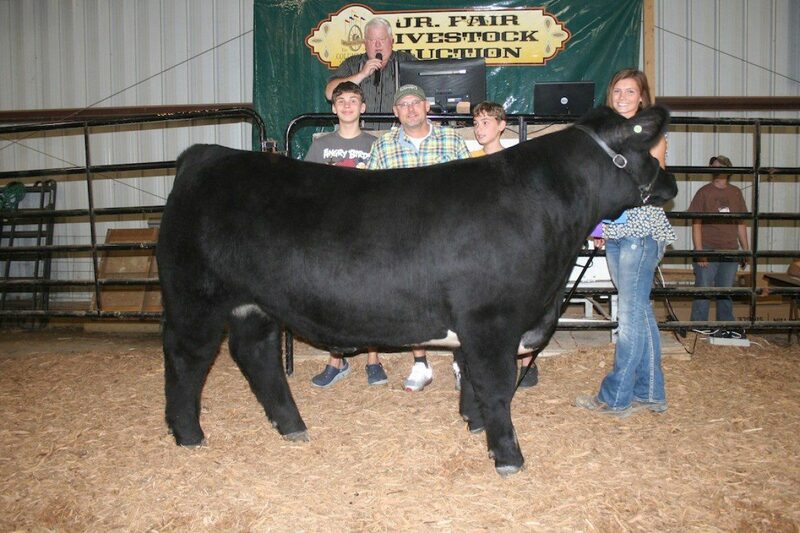 Drake was also the senior skillathon winner and showman of showmen. 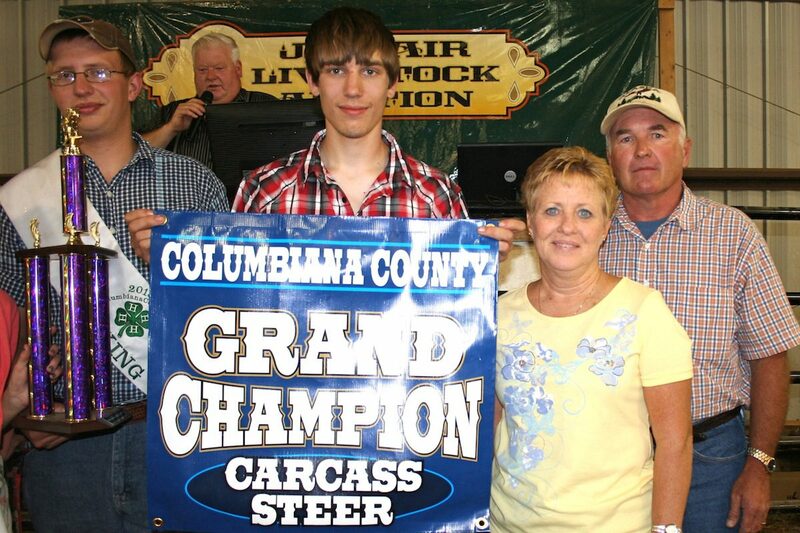 (Farm and Dairy photo) Brent Reisner raised the grand champion carcass steer, which sold for $1.75 a pound to Jeff and Sheryl Hoopes for their family’s use.